Sometimes, a room needs a little color. 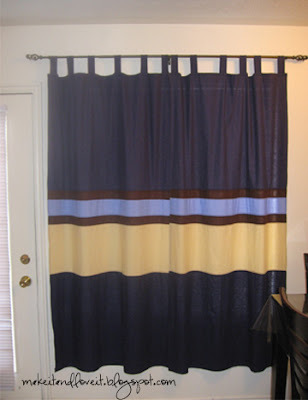 However, it’s HARD trying to find curtains/window treatments that match the color scheme of a room sometimes. You’ll need to first decide the exact dimensions of your new curtains. Measure around your window and decide how much longer you’d like your curtains to hang and how wide. Add 12-24 inches or so to the width (depending on how wide your window is) if you like them to ripple a little bit as they hang, and not hang straight across. Also, add a seam allowance to all of the sides before cutting, to make sure you don’t end up with smaller curtains than you wanted. Then decide what colors you’d like to add to a room. You might want to coordinate with a couch, some throw pillows, or in my case, some place mats for my dining room table. Finally, hem around all of the edges and iron again. Cut strips of fabric that are 4×10 inches. Fold the strips in half, lengthwise, and sew a 5/8 inch seam. Turn the strip right-side out and iron. Do this to all of your strips. (Decide how many you’d like and how many you need to keep your curtains hanging up securely. I attached mine about 12 inches or so apart.) Then turn one end under about a 1/2 inch and attach to the front of the curtain, about 1/2-3/4 inch down. Then fold the other end under about 1/2 inch and attach to the back of the curtain, exactly opposite of the first end. Then make another seam close to the top edge, sewing together both sides of the loop and the curtain itself. This will keep the loop in place and will help the curtain to hang straight. Hang your curtains………….and you’re all done. we're moving soon to a new apt with bigger and more windows. i was just thinking before i went to bed last night how i would love to make some curtains. i wondered if you had made some…you have. perfect! thanks so much for making it easier for me. wondering what type of fabric you used for these curtains? I used linen for these curtains. I bought all of the linen fabric at Joann's a couple of years ago…..but have noticed they still carry a variety of linen there.